I am such an admirer of older women, I can't hide it. I just LOVE the wisdom and wit of women's stories and their ability to live through adversity, all the while championing children and others to work hard, form your beliefs, stoke your passions, and take action for positive change. And for women's sense of humor; wow! Imagine a 102-year-old woman trekking from Arizona to Philadelphia in the summer heat wave and attending the DNC convention, being handed the mic and announcing lustily, "we cast 51 votes for the next President of the United States, Hillary Rodham Clinton!?" And yet a few days ago, Jerry Emmett was quoted as saying, "I just hope I don't embarrass anybody by passing out or something." 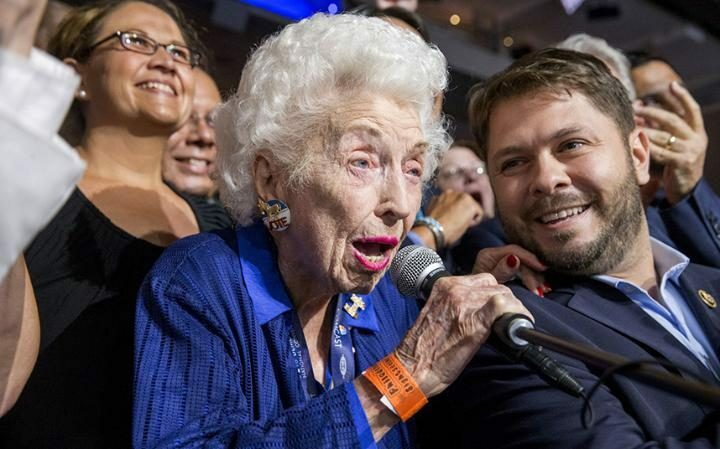 She was born before women had the right to vote, and remembers with vivid acuity the first time she saw her mother vote, exclaiming there was clapping, cheering and dancing in the streets, by women and men. I love Mrs. Emmett now conquering her legal blindness, her loss of hearing and whatever other health ailments that befall 102 year-olds, to continue to serve. I celebrate her tenacity and to borrow Meryl Streep's words, 'Grit & Grace'. It certainly appears that Jerry Emmett has joined Hillary in following the charge of John Wesley, the founder of Methodism, "Do all the good you can, by all the means you can, in all the ways you can, in all the places you can, at all the times you can, to all the people you can, as long as ever you can." With my Master's Degree in Retirement Planning, I've heard countless stories from older women as to how they dutifully saved and 'did without' all because they wanted to provide their children with some experience, some tangible gift or even occasional toy. These acts also mirror the admonition of our great late President Kennedy, who stated, "ask not what your country can do for you; ask what YOU can do for your country!" Women are used to giving, we get a lot of satisfaction from giving, and yes, some women have even paid the ultimate sacrifice by giving to our great country through their military service in more recent years. We honor each and every gift and are humbled by them. That said, I want to champion women giving attention to themselves; caring for themselves. Caring for their health, their money and investing in themselves. I seek to do all I can to help people invest wisely so that their investments last as long as they do. After all, my maternal grandpa living to his age 88 and my paternal grandpa living to his age 96, make me keenly aware of longevity. Especially since they died in 1989 and 1986 respectively. In other words, with significant advances in science, I fully believe a lot of folks will live to be centenarians. It is my life's mission to help ensure that folks' money lasts at least as long as they do. If you are retired or are near retirement and harbor any worry that your money is disappearing way too fast, why wait? Why not consult with a Fee-Only CERTIFIED FINANCIAL PLANNER™ now to get an objective and seasoned professional opinion about whether your assets are positioned to outlast you.